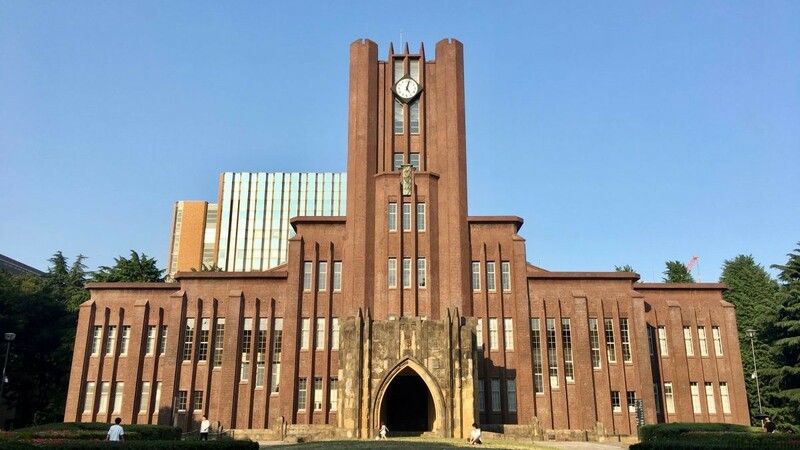 Tokyo University (Todai for short) is Tokyo’s most prestigious and oldest, but not really that old. It was established in 1877 as part of reforms to create western-style institutions. If we look at higher education in the broader sense, Yushima-seidō from the 17th century is the true winner. While the official establishment of Tokyo University dates from the end of the 19th century, the roots of Tokyo University go way back. When it was established, a number of organizations were merged into this new higher institute for learning. One of the organizations that was merged was called the Tokyo Kaisei School, of which its origins can be linked to Tenmonkata (the Astronomy Agency), which was formed in 1684. The location of the Hongō campus is the site of the former Kaga Domain Edo Mansion. After the Meiji Restoration (1868) there was no longer a need for feudal lords (daimyō) to spend time in Tokyo, so all of these locations in the capital were seized and reallocated. Both the Red Gate (Akamon) and the Sanshirō Pond are remnants from this Kaga Domain Edo Mansion. Many of the buildings date from the 1920s and 1930s at Hongō campus. While I am prioritizing old structures on this website, there are of course also many new buildings to enjoy here with exquisite architecture such as the Yayoi Auditorium (2000, by Hisao Kōyama) and the Daiwa Ubiquitous Computing Research Center (2014, by Kengo Kuma). As part of my job, I often visit Tokyo University, and somehow I keep on coming back during my leisure time as well. I have already written several times about Tokyo University while exploring Edo Mansions and Natsume Sōseki. I always enjoy a stroll on the campus and find interesting new nooks in one of the gothic-style buildings. University students explain about the university’s history and student life on campus. Both English and Japanese tours are available. These tours are available in 2 settings: small groups (9 persons or less) or big groups (10 to 50 people). Both types take about 2 hours and take you to the main sites: Red Gate (Akamon), Yasuda Auditorium, Sanshirō Pond. Reservations can be made through the university’s website. Tokyo University is spread out over several campuses: Hongō, Komaba, Nakano, Shirokanedai, Kashiwa and Kemigawa. 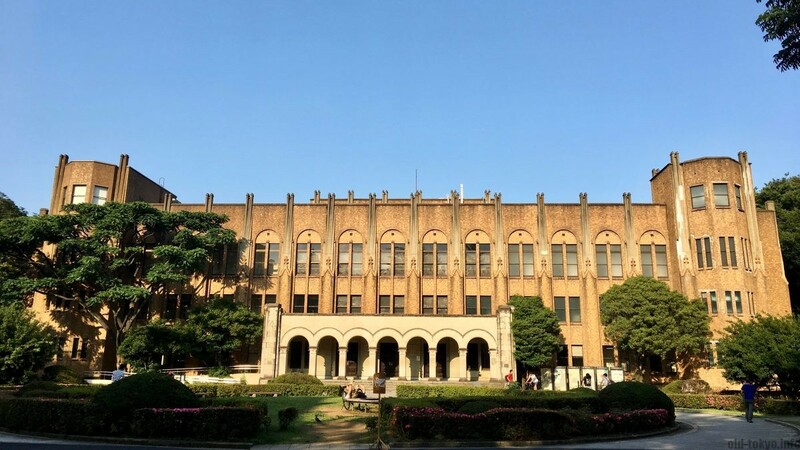 The Hongō campus is the oldest and most interesting to visit, please note everything in this article is about the Hongō campus. The Communication Center (immediately next to the Red Gate, turn left after you get through the gate) offers souvenirs and other memorabilia. 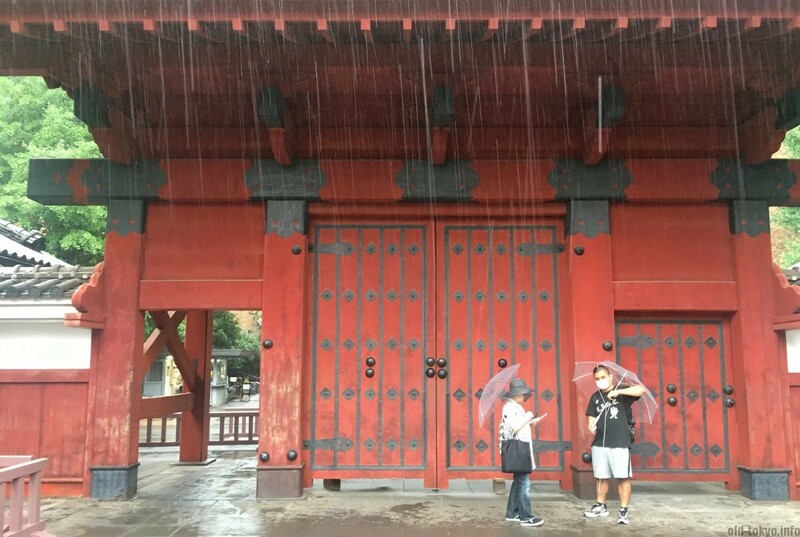 This gate predates Tokyo University and belonged to the Kaga Domain Edo Mansion. This mansion housed the Maeda clan lord of the Kaga Domain (Kaga was partially covering the current Ishikawa and Toyama prefectures) and the red gate was built at the occasion of the marriage of one of the lords in 1827. Read more in my article on the Red Gate. Natsume Sōseki studied at Tokyo University and later came back to teach from 1903 until 1907, right after he returned from London. His novel titled Sanshirō (1908) had such a strong response during the time that the pond came to be called Sanshirō Pond, after the protagonist in Sōseki’s novel. 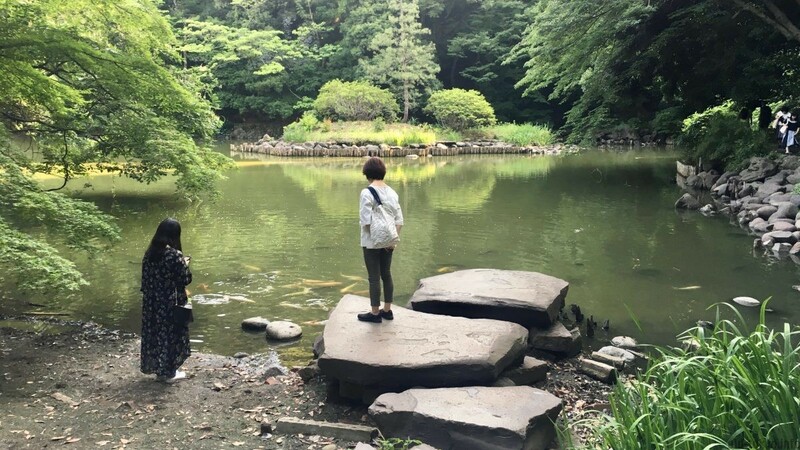 Check my article on Sanshirō pond. For me this is the real symbol of Tokyo university (rather than the red gate). It is one of the most famous buildings in Japan. Whenever Todai comes up in popular culture such as manga or anime, for sure an image of Yasuda Auditorium is used. 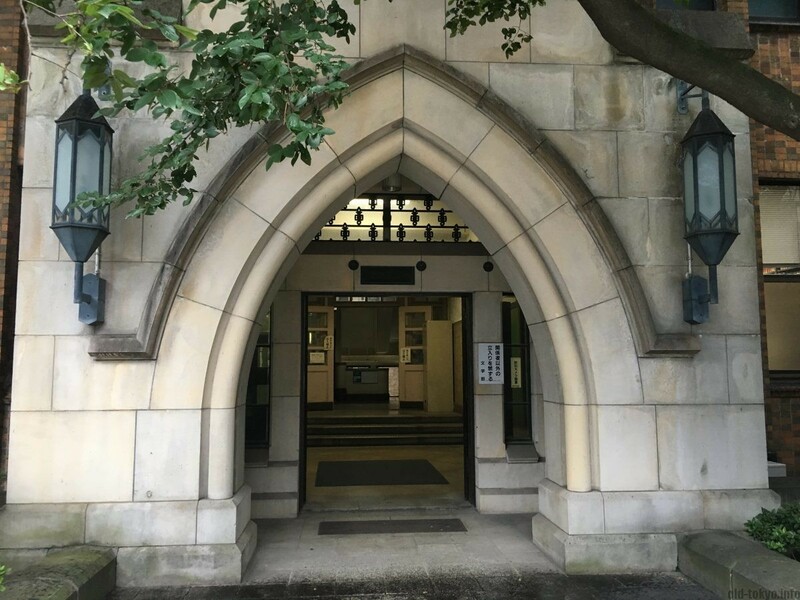 The building is named after Zenjiro Yasuda (a founder of the Yasuda zaibatsu), who made donations to the university to build it. He gave the money because he thought the university needed a building of sufficient grandeur in order to receive the emperor. The auditorium can seat 1000 people and is built in a neogothic style designed by architect Yoshikazu Uchida (more on him later) reflecting the building style in the 1920s in Japan with a dark red tile exterior. Inspiration from the design comes from the towered gates of Cambridge University. The ginkgo leaf is in the university’s logo and is also considered a symbol of the university as it stands for endurance and longevity. 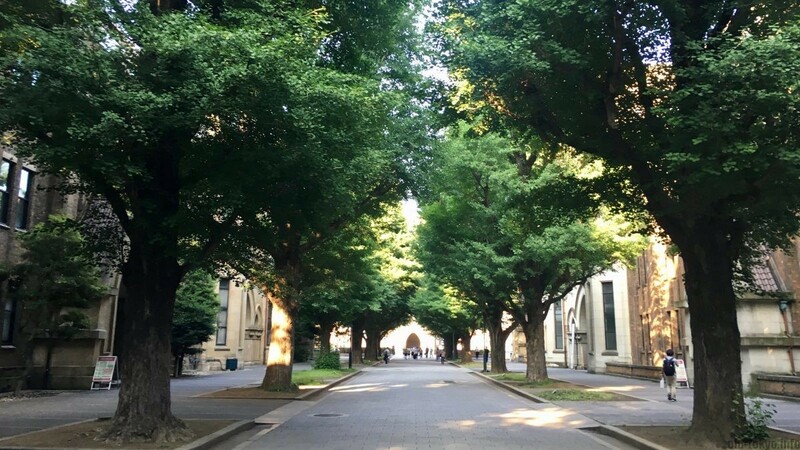 The main lane towards Yasuda Auditorium is lined with these trees, making a very nice sight in autumn when the leaves turn yellow. They can also be rather smelly during that time though. This lane was created in 1906 with ginkgo trees being transplanted from Koishikawa Botanical Garden. The campus is full of buildings designed by Yoshikazu Uchida. Many buildings date from right after the Great Kantō Earthquake in 1923 after much of the campus was destroyed. 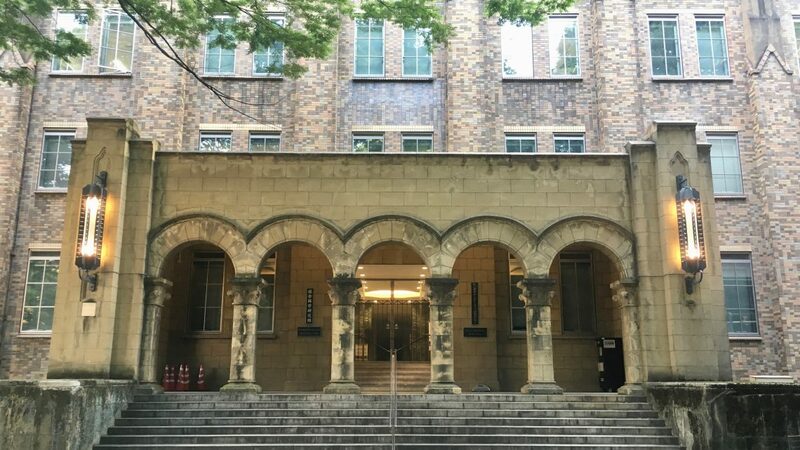 Yoshikazu Uchida (1885-1972), architect and structural engineer (and 14th president of the university 1943-1945), was responsible for designing the bulk of new buildings. He designed 30 buildings in the style that become known as “Uchida Gothic” with massing, towers and pointed arches. Above is the Faculty of Medicine Building 2. This is the main building of the Faculty of Medicine completed in 1936. If you come in through the Red Gate (Akamon) and you go straight, this is the building you walk right into.